One of the most important parts of any pond is the filtration system. This is especially true when it comes to koi ponds because, as you may know, koi are notoriously messy fish. Just like fish that you keep in an indoor aquarium, koi need clean water with the right chemistry to thrive. Because koi themselves have such a big effect on water quality, it’s not always easy to keep things clean. That’s why getting the best filter for koi pond is so important. What is the Best Koi Pond Filter System? How to Set Up a Koi Pond Filter System? A koi pond absolutely needs a filter because, as we mentioned, koi are more than a little messy. The filter works in conjunction with the pump to make sure that the load from the fish as well as any debris that gets into the pond is taken care of. Another thing to consider is that, in the right conditions, your koi will grow pretty quickly. Depending on how many koi you have, the bioload increases exponentially year after year. Even if you got by without a filter for a short time, it won’t be long until you need one. The right filter will keep your koi happy and healthy and your pond looking great. If you’re looking for the right filter for your koi pond, you’re in the right place. Here are some of the best ones available. This filter from XtremepowerUS is really powerful. At a rate of up to 10,000 liters per hour, it’s suitable for koi ponds up to about 1500 gallons. It includes 3 layers of sponges for a perfect environment for good bacterial colonies to grow. There are 3 different connections: ¾”, 1 ¼”, and 1 ½”. It also includes a 13-watt UV light to break up algae colonies so you won’t have to worry about getting any additional pieces. The long 15-feet long electrical cord helps make set up easier, too. Next up is this filter from Grech. It’s powerful enough for a koi pond up to 900 gallons and has a compact design that’s easy to install and can be hidden out of sight at the edge of the pond. It uses mechanical and biological filtration as well as modern UV technology to keep the water clean. This filter has a simple cleaning system that doesn’t require opening and cleaning foam constantly, making maintenance quick and easy. It comes complete with inlet and outlet hose adapters to make set-up a little easier. 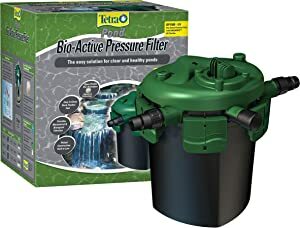 Another great option is this filter from Tetra Pond. It comes with a UV clarifier to break up algae so they can be removed by the mechanical and biological filtration medium. Something different about this filter is it uses bio-activators instead of foam. Bioactivators trap debris and provide a large surface area for beneficial bacterial colonies to grow. When using the backflush feature for cleaning, dirt, and debris are quickly washed away while the bacteria colonies remain intact. 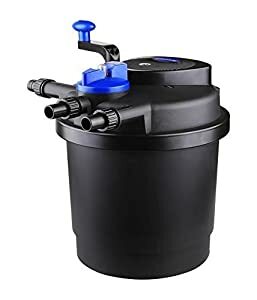 This is a great filter for ponds up to 1500 gallons and should be used with pumps that flow at 2500 gallons to get the right amount of pressure for adequate filtering and backflushing. Also, avoid pumps that exceed 4500 gallons per hour as they could damage the filter. The OASE BioSmart set up is really effective. It utilizes different zones to promote effective beneficial bacteria growth. 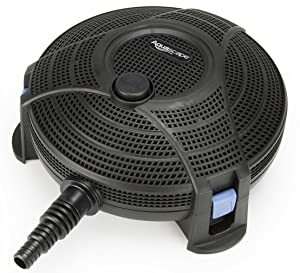 This would be a great choice for a koi pond up to 1250 gallons and the cleaning indicator, temperature gauge, and sludge drain make it extremely user-friendly. Another great thing about it is the built-in cleaning mechanism. You don’t have to remove or manually unclog any of the filter foams so maintenance is really easy. Just turn off the pump, pull up on the cleaning handles, and allow the debris to drain. This filter from Aquascape is completely submersible. It has a large surface area for maximum filtration but uses small openings prevent the filter from clogging with larger pieces of debris. It’s compatible with most submersible pumps and includes a multi-hose fitting. Another way it helps prevent clogs is with a pre-filtration sponge that provides mechanical and biological filtration. This keeps any debris that could cause damage from entering the pump which cuts back on maintenance time. That’s not all, the ceramic rings used in this filter provide a huge surface area for beneficial bacteria which helps provide the levels of filtration you need for a koi pond. The removable cage makes cleaning really easy, too. Last but not least is this all-in-one unit from CNZ. It’s a great choice for small ponds and was designed for easy setup. The best thing about it is that you don’t need to buy a separate pump and it has an integrated UV lamp. This one does it all. This filtration system is fully submersible so you don’t need to worry about hiding it or blending it into the landscape. In addition to a large foam filter, there are 3 filtering baskets where you can place your favorite filtering media. One of the best things about this system is that it can also be used as a water feature. It includes 3 different fountain attachments as well as a splitter to set up a waterfall to help you create an eye-catching display. Our pick for the best koi pond filtration system is the CNZ All-in-One Pond Filter System with UV Sterilizer. We love that it’s not only a filter with an integrated UV light but a pump and water feature, all in the same durable package. Another great thing about it is that there are 3 different filtering baskets where you can easily add the filtering media of your choice. This allows for a lot of customization so you can tailor the filter specifically to your pond’s needs. The first thing that you should consider with deciding on a koi pond filter is how much money you want to spend. You should set a budget not only for the pond itself but also specifically for the filtration system. Every pond is different and the filtration system is the most important features. There are ways to save money when setting up a koi pond but the filter system is one area where you can’t afford to cut corners. If you have a small pond, you can usually get by with a simple all-in-one filter that acts as a fountain or waterfall. It pushes water through the filter quite effectively and is an attractive addition to your pond. For larger ponds, though, it’s a little more complicated. Here are some things to consider when deciding on the best filtration system for your pond. The first thing you need to do is figure out how much filtration you need. This is based on the volume of your pond. It’s easy to see why this is important, the more water you have in your pond, the more filtration is needed to keep it clean. If you’re using a hard plastic pond liner, it should tell you the exact volume. If you’re creating your own shape, figuring out the exact volume can be a little tricky but it’s pretty easy to get a close estimate. Use this formula: Length x Width x Height. There’s more to filtration than volume. Next, you have to take into account the fish you’re going to put in your pond. If you’re going to be keeping koi, you have to quadruple the volume of the tank. Because koi are messy fish! They produce a lot of waste so the filtration system needs to work 4 times harder than it would with an empty pond to keep it clean. By contrast, if you were keeping goldfish, you would only have to double the volume. It’s also worth noting that the result of this calculation is a minimum amount. You should choose a filter that’s as close to this figure as possible. For example, if you have a 400-gallon tank and there are 200- and 500-gallon filters available, the 500-gallon option is the best choice. In a pond filtration system, UV filters are responsible for making the algae easy to catch in the filter sponges. How do they do it? By emitting ultraviolet light which forces the algae to clump together so it’s easier to catch as it flows through the filter. Some filters have a built-in UV clarifier, others will require a separate piece be put in-line. Both are effective but it’s important to know that there’s more than one kind available. It important that the filter and the pump are compatible. For the filtration system to work, the pump has to have a flow rate that will get the right amount of water to the filter itself. Most pumps will clearly tell you how many gallons or liters per hour they cycle. A good rule of thumb is to match this to the volume of your tank. That means that the entire pond will be cycled every hour. If you’re planning to place your pump above the surface of the pond, you’ll need one that is a little more powerful because it will have to pump the water out of the pond, working against gravity. Getting the right size filter is important. Too weak and it won’t be able to cycle enough water. Too strong and the filter-box could overflow. Remember that pumps have a lot of electrical components and electricity and water can be dangerous together. Make sure you place your pond in an area where the cables and cords can be safely placed. If you want to be extra cautious, consider investing in a switch box so you have a dedicated place to safely run the electronics. Setting up a filtration system is actually pretty easy. While you should follow the manufacturer’s instructions specific to your filer, there are some basic steps that they’ll all have in common. The first thing you need to do is determine the layout of your pond, keeping in mind that you have to work the filter, pump, and piping into the design. Next, lay whatever piping you need to create a closed-loop system, from the pump to the filter and back into the pond. Depending on your layout, this can be very extensive or really simple. After you have the piping laid out, it’s time to set up the electrical components. Each pump has its own requirements but most run on the standard household power of 100 volts. Check the specifics of your pump for wire size and circuits breakers. Also, remember that any electric cords being used outdoors need weatherproofing and should be run through conduit. When the power is set up, it’s time to put the pump and filter in place and make the final connections. Turn the pump on and make sure it’s working properly. If not, begin troubleshooting by checking that all connections are secure. If you have a small to medium-sized pond, our pick is the CNZ All-in-One Pond Filter System with UV Sterilizer because it’s more than a filter. 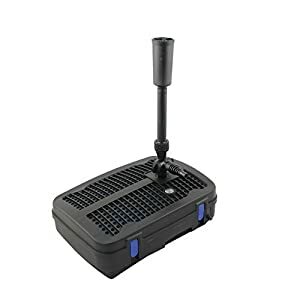 In addition to having an integrated UV light, this product is also a pump and can even be used to create water features.